Scio Diamond Technology Corp. (OTCBB:SCIO, SCIO message board) has recently been doing quite well in the charts as it made a really good run up the charts in the second half of December, following some news about $2.5 million that the company received though financing activities. This brought of SCIO to the edge of the $1 per share mark after the ticker gained a whopping 167% to its value in a matter of days. The news of such financing were indeed significant and the effect of the press release wasn’t something unexpected considering the tough financial situation in which the company was in the end of the third quarter of 2014. And not only did the company stock manage to surge in the second half of December 2014, it also managed to hold its levels. Although SCIO had a hard time going above the $1 per share mark it certainly managed to hold its positions and didn’t register any significant losses throughout the first half of January. It didn’t, however, manage to go further up when another press release concerning $2 million more that the company had acquired through equity financing hit the wire on January 15. And without any particular reason we see that SCIO has climbed higher in the recent sessions and investor interest has been high yesterday. 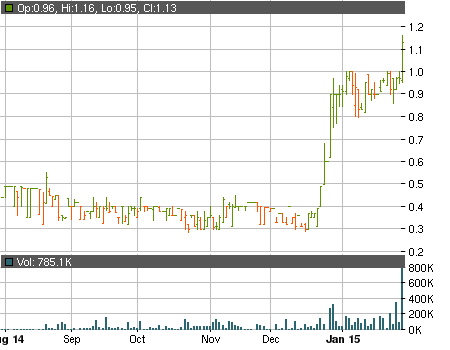 We see no apparent paid promotion, no press releases and not a lot of chatter on investor forums and yet SCIO managed to add 16.49% to its value in yesterday’s session, reaching a price of $1.13 at the final bell. The volume was the biggest in the past year and the 814 thousand shares that changed their owners generated $856 thousand in daily trade value. Still, this unprovoked movement leaves us concerned as the ticker might suffer a correction if there is nothing to back it up. In any case, be sure to do your due diligence and weigh out the risks before putting any money on the line.